Is my mind playing tricks on me? My first memory of a out of body experience was during my senior year of undergrad. At the time, I purposely created my class schedule so that I had time to go home for lunch and nap. Eventually, the time that I looked forward to the most (nap time), became frightening. I would have a weird dream every time I took a power nap. After having the same experience repeatedly, my daytime dreams no longer felt normal. Eventually I googled what was happening to me and the description of my dreams matched out of body experiences. Not sure what I'm talking about yet? 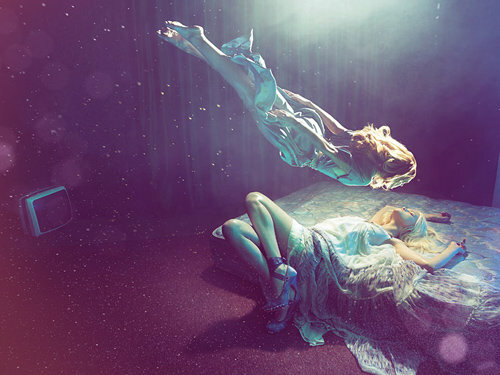 In a nutshell, out of body experiences are dreams when your soul separates from your physical body. You try to wake up, but something unnatural presses you to stay there. In many of my out of body dreams I am placed in some kind of physical situation where I have to fight, run, or jump. Typically I have to get physical to get out of the situation; the push and pull of whatever I aim overcoming is something that I physically feel during the dream. During this time you feel your spirit return quickly to your body. The spirit rushes back at such a fast rate that if feels like your body is being slammed against a table. The shock of the spirit going back to your mortal body immediately wakes you up in shock. Comment and leave your out of body experiences below. Pretty trippy.